RALEIGH, N.C. – Some of life’s biggest fighters come in the smallest packages. For the Griffith family, a world-class fighter came in the package of a little girl who loves her blonde pigtails. Two-year-old Eve Griffith bravely took the stage at National Agents Alliance’s “Key To Tomorrow” Leadership Conference on July 14, along with her family and a Duke Children’s Hospital representative, to deliver a message of hope and perseverance. 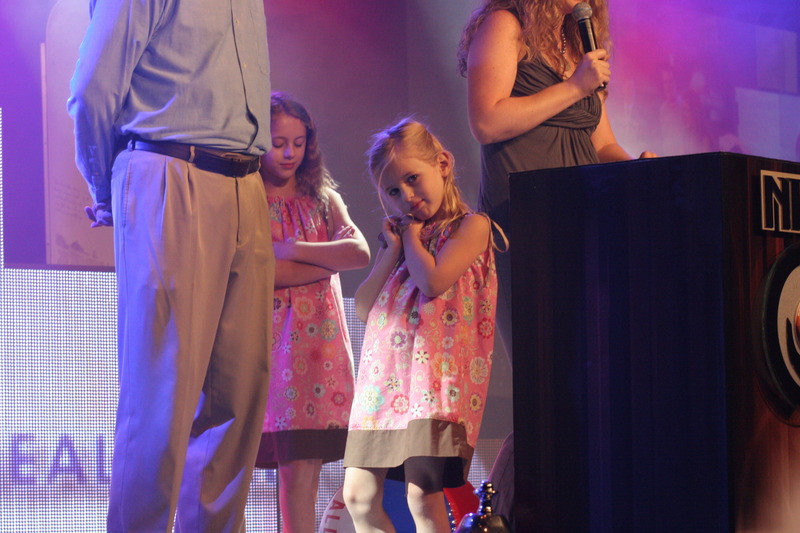 The Griffith family told their harrowing story of the life-changing day in October 2009, when doctors discovered a tumor, which led to Eve’s diagnosis of bilateral Wilms (cancer of the kidneys) and focal anaplasia. After 12 weeks of aggressive chemotherapy before having a nephrectomy, radiation, more chemotherapy and four surgeries at Duke Children’s Hospital, Eve completed her treatment in May 2010 and is now cancer free. Today, you could never tell that Eve endured such a life-threatening ordeal as she played with her siblings on stage with NAA beach balls without a care in the world, which gave the audience endless amounts of laughter. Eve even struck several poses like an experienced supermodel for the camera as National Agents Alliance photographers snapped photos of her on stage. NAA President and CEO Andy Albright presented Duke Children’s Hospital with a $5,000 check, and presented Eve with a $500 check to start her college fund. To follow Eve on facebook, visit http://www.facebook.com/EveVsWilms. She is one of the first Duke Children’s Hospital patients to use social media to raise money for cancer research.